There is a poem embedded in this barcode detail by Robert Henriquez. A triptych by Henriquez on view at the Eclips Mill Gallery. Another work for the series by Henriquez. 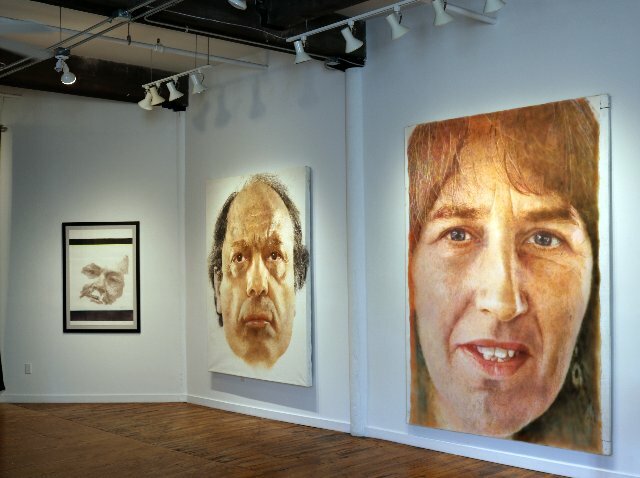 Installation of monumental portraits by David Zaig. Fiona the artist's former wife. Harvest Festival by Charles Giuliano. Inkjet on canvas. Over decades, I curated exhibitions that included work by the conceptual realist artist, David Zaig. This started when he asked me to write an essay for his solo at Boston’s Copley Society. That was followed by many projects and traveling exhibitions. His work was included in both landscape and portrait exhibitions. Networking with other curators we linked venues. Shows traveled between Northeastern University, Westfield State College, and Montserrat College of Art in Beverly, Mass. I also curated shows for the Danforth Museum of Art, Fitchburg Art Museum, The Institute of Contemporary Art, and the Gallery at Boston City Hall. Later I became director of exhibitions for the New England School of Art & Design at Suffolk University. Pooling resources we managed to publish several catalogues for exhibitions. The opportunity arose to curate an exhibition that concludes the season for the Eclipse Mill Gallery in North Adams. As the project evolved it came to include myself, Zaig who also resides in North Adams, and Robert Henriquez from Pittsfield. Considering our relationships as artists and friends evoked the title of the exhibition “Amigos: Charles Giuliano, Robert Henriquez and David Zaig.” Another unifying factor has been ambition and scale. While approaches are different the stunning installation strongly reveals confluence and commonality. There is a generational aspect as concepts in the work have developed over time with fresh bursts of inspiration and technical innovation. Last summer Arthur DeBow curated a forty year retrospective of my arts related photo journalism for Gallery 51 of Massachusetts College of Liberal Arts in North Adams. There was a learning curve to create large digital files, tweaked by Photoshop, for Beck’s Printing in North Adams. The resultant works offered new approaches for vintage slides and negatives. For Amigos I created three, large works based on vintage photo collages. 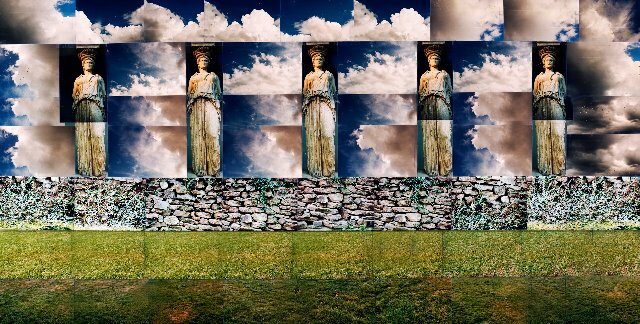 They were created by using transparent tape to assemble composite images from commercial snapshots shooting analog film. That work ended with a switch from analog to shooting digitally. 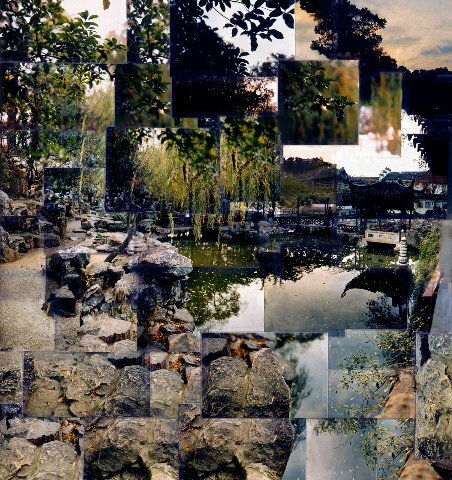 There was an intermediary step as the collages were rephotographed resulting in large positive transparencies. In the past these were scanned to create giclee prints on Arches paper. When Henriquez viewed the two images in my exhibition he asked how and where I created them. 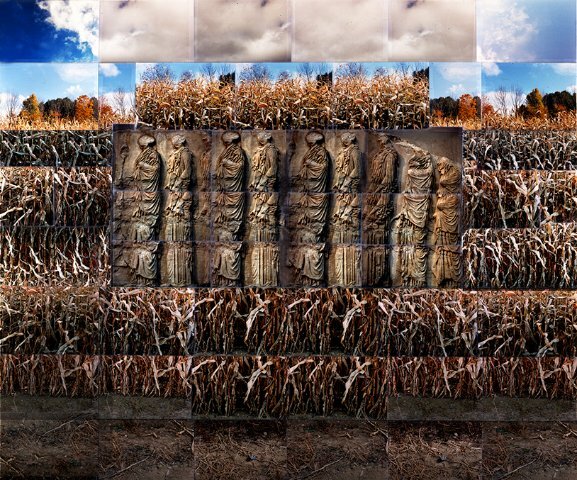 He negotiated with Beck’s, pushing their limits, to create three new images. Previously, he worked with a New York company to create large works that were featured at the Berkshire Artists Museum in North Adams. Zaig also has shown with the museum. Months of research and sweat equity went into new pieces. There were frustrating obstacles to overcome. That makes the resultant work all the more satisfying. Once the prints were made they were mounted to museum standards by Chapman Studio Frame & Crate in North Adams. It is exciting for Henriquez to be able to create high tech, state of the art, works in his own back yard. 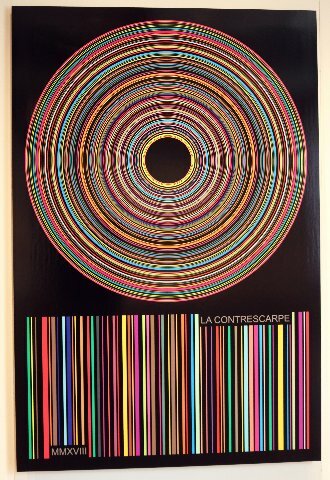 He offers observations regarding the work “The Universal Product Code (UPC) commonly known as ‘barcode symbology’ is an optical machine-readable representation of data relating to the object to which it is attached. The mapping between messages (data) and barcodes (UPC) is called a ‘symbology’. The UPC Symbologies in this work are real and scannable, albeit with a scanner and proper licensing apps. I gave them size, line, form and color, the usual criteria of formal abstraction. They are designed to look like a signature motif or trademark in a contemporary visual sense, thus taking on the same value as those barcodes affixed on everyday products. 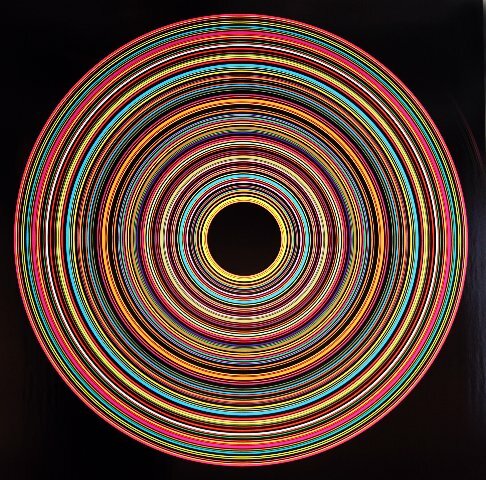 “In my work the UPC symbology is not subject matter, but its form. 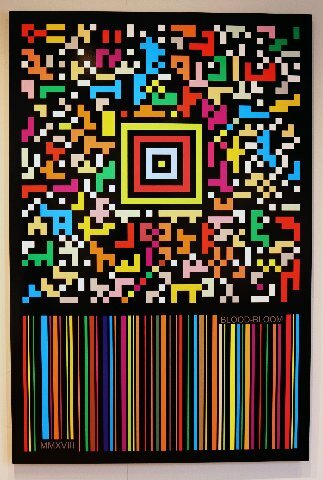 The concept is to pictorialize the ubiquitous barcode iconography as a potential aesthetic for a different text-based art, insofar as the image is generated by a text. To paraphrase Arthur C. Danto: what makes the difference between a barcode printed on any product and a work of art consisting of a barcode is a certain theory. It is ‘theory’ that takes it up into the world of art and keeps it from collapsing into the real object, which it is. The theory here is that the UPC symbology can express something abstract in a concrete form, while accurately maintaining its functionality.” J.M. Robert Henriquez. 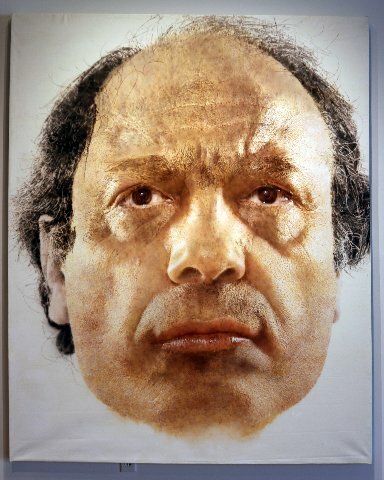 The Israeli born and British trained artist (Royal College of Art), David Zaig, in the 1980s created monumental landscape and portrait, super realist, airbrush images. Most were sold and only a few remain in his studio. 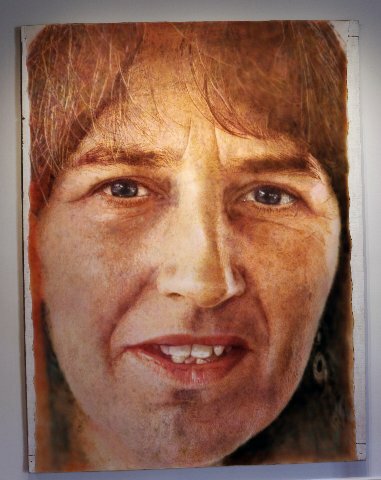 The current exhibition includes two examples of this monumental work: “Self Portrait” and a portrait of his former wife “Fiona.” At that scale there is an astonishing attention to greatly enlarged, minute details. In addition to these large works is a framed work on paper, a portrait of the curator, as a much younger man. This piece reveals the conceptual aspect of his style as there are inexplicably absent areas in the facial topography. While a masterful photo realist there is a conceptual aspect to his thinking of which a smaller example is on view. He has created a lot of work in this manner. Also, he has been writing plays with complex discursive, philosophical narratives. As artist and thinker Zaig plays a three-dimensional chess game. In the past few years he has returned to painting with a brush. 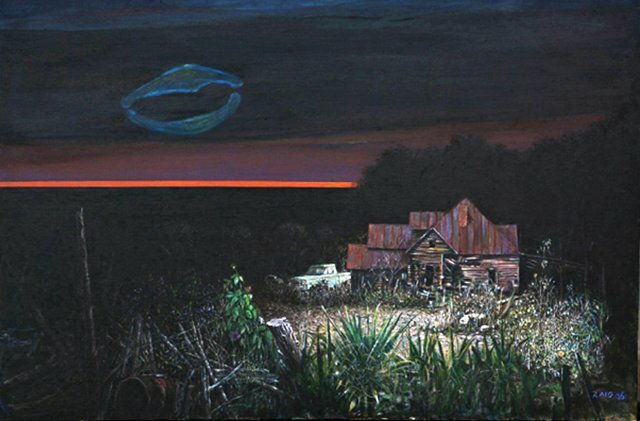 In this exhibition that entails a moody twilight view of his wife’s ancestral farm near Ashville, North Carolina. There he painted a charming, smiling, evocative portrait of his brother-in-law. The artists will discuss their work Sunday, December 2, 3 to 5 PM.